Two more weeks. That's it. It will be over. I will finally be football free in my house, until next fall of course. It has been a LONG three months. Football takes over your life, your family's life. Yes, we are still talking about my 9-year-old son Peyton here. I will not miss trying to keep the other kids entertained and off the field. These kids will not miss football, but they will so miss the concession stand. Lots of gluten free junk food! Practice three days a week, weigh ins, games, volunteer time. Frankly, it is too much for everyone, well me. Look, I knew this day was coming. My husband played football since he was nine and continued through college. So did his three brothers. They are a football family. They are fabulous tailgaters, supporters and football fans. The moment I found out I was having a boy I knew this day was coming. But I thought I could handle it. I mean I like football. I was raised on SEC football and my family still has pictures of the great University of Alabama football coach Bear Bryant on their walls. My father has lived in Pittsburgh, Pennsylvania for almost 20 years now and we are all proud members of SteelerNation. Football is just great, unless my son is playing it I discovered. Another reason I thought I could handle this, was my competitive nature. I want to win and I want my kids to excel. During Peyton's baseball season he was in a hitting slump that was making him miserable. I actually sat in the bleachers hoping the pitch would hit him so at least he would get on base. What kind of mother does that? One that could handle football you would think, but you would be wrong. Ice on an injured player's neck, a sight so normal at a football game. Normal unless it's your kid. During this Saturday's game, Peyton was hitting hard and getting hit hard. He came out of the game because his ears were ringing and his neck hurt. Are you kidding me? It was the first time at a sporting event that I wanted to run on the field and cradle my son. Just like the book "Love You Forever." 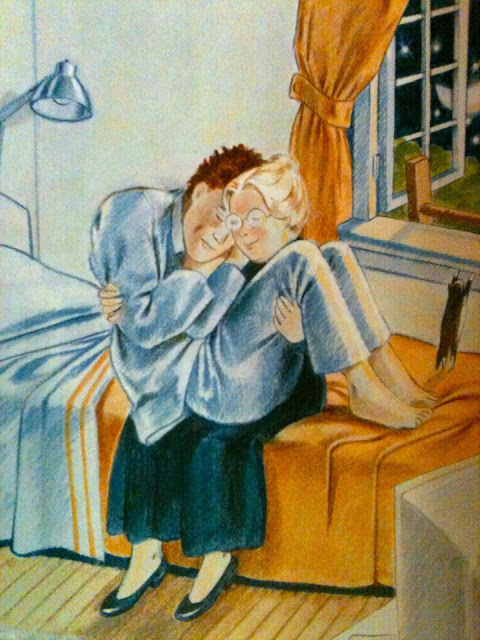 When my kids were little the book creeped me out. I majorly disliked the idea of the old lady mother driving over and picking up her grown son and rocking him "back and forth, back and forth." But I totally get it now people! I used to think this was so creepy when my first child was a baby, but now I totally get it. It all feels so strange to me and barbaric. It feels like child abuse. I want to run down and get all his equipment and go home. But the problem is, he loves it. And his dad loves it. And together they love it. Ugh. "You realize you are going to have to find a way to deal with this because you have about 16 more years of football," my husband Tim lovingly told me the other day. I have one word for you....Golf. I am going to get the other kids totally into golf. No head injuries there. No taking over your life with practice right? Before our football-filled Saturday, we went on a moonlit hayride on a farm. Loved the hayride, but of course the animals freaked me out a bit. The kids enjoyed the hell out of everything which always makes it worthwhile. My daughter, Lucy, enjoyed the evening the most. So much so now she wants to live on a farm and is convinced that when we sell our house that is where we are moving. She called me into her room later that night to see a letter she had written. At first glance, I thought she heard what I had called the grumpy goat that got a little too close for comfort. he was going to jump out of his stall. 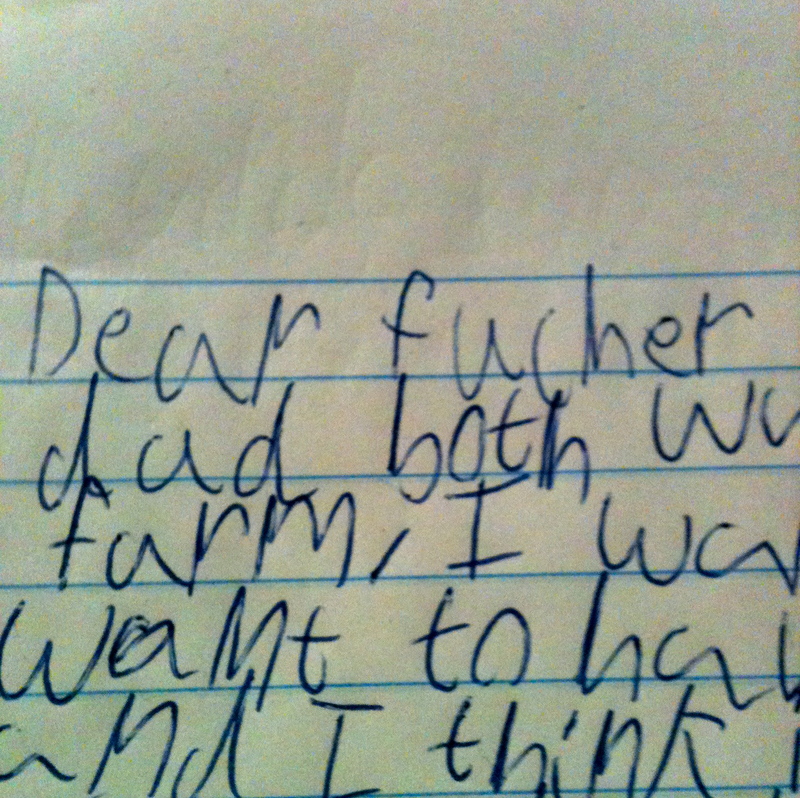 But she read her letter aloud and it said "Dear Future," not "Dear F*%&er." Phew to that. Anyway she wrote a letter informing future she wants to live on a farm and be so busy with chores she doesn't have time to clean her room. Okay, I'll give it a try. Dear Future, I will not live on a farm ever. My kids will all be very impressive golfers and shun football or any other dangerous sport. I will not be a hoarder and I will be thinner and taller. Love, Me. But in my immediate future we are heading to football playoffs. Two more weeks. I will worry about the next 16 years later. Compelling sign hanging in the barn. This was my reaction when I heard Peyton's team was heading to playoffs which meant two more weeks of football.